First Amendment Gallery is proud to present BUZZ, a solo exhibition by Oakland-based painter Kyle Dunn. The works exhibited delve into the complexities of human perception, and how individual lines can be repeated in ways that can both synchronize and disrupt a pattern. Although op art has existed for decades, it warrants continuous reexamination in the information age. Dunn scrutinizes perception by incorporating digital elements and recreating them in the archaic medium of painting. By allowing messier and more chaotic compositions appear in the work, he aims to disrupt the orderly nature of graphic art and trade that cleanliness to show his personal artistic hand. His obsession with repetitive linework allows him to manipulate lines near-microscopically through interweaving, overlapping, and distortion. He continually explores the general concept of a line while allowing the full image to communicate on its own. 14 x 20 Inches. Framed. 2019. 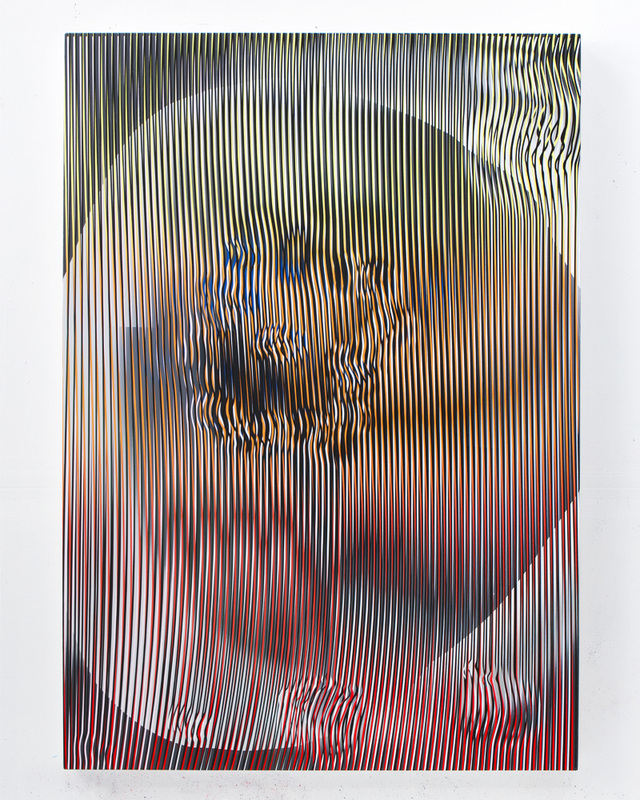 Kyle Austin Dunn is a visual artist based in Oakland, California working primarily in painting and sculpture. He has shown work at Circuit 12 Gallery in Dallas, TX, Hap Gallery in Portland, OR, Headlands Center for the Arts in Sausalito, CA, Pro Arts Gallery in Oakland, CA, and SCOPE Art Fair in Miami, FL. He earned an MFA from UC Davis in 21012 and BFA from the University of Florida in 2010. He is creatively inspired by the enigmatic influences that guide our conditioning. Kyle Dunn - "Four Imprints and a Compromised Suggestion"